How good it is to find a Canadian play that deserves all the praise and awards it has won. Michael Healey's opened in February 1999 at the Theatre Passe Muraille and has since gone on to win a Dora, a Chalmers and a Governor General's Award for best play. This, the third production of the play in Toronto, is part of a Mirvish sponsored national tour. A tour of the Prairies is currently in progress organized by Theatre Passe Muraille. On April 22 it had its US première at the Steppenwolf Theatre in Chicago (requiring the use of a dialect coach!). What makes the play so successful is its simplicity and lack of pretence. In very natural dialogue, laced with unforced humour, it tells a story complete in itself but with implications encompassing the function of storytelling, the nature of memory and the meaning of theatre itself. 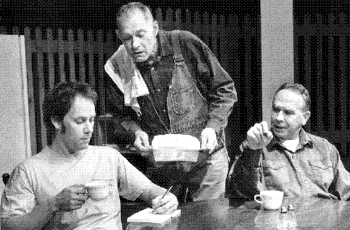 Taking as its background the collective creation of "The Farm Show" by Theatre Passe Muraille in Toronto in 1972, the play follows Miles, a Toronto actor, who is billeted with two bachelor farmers in Southern Ontario to gather information for a play about farming. Morgan, the dominant one, takes care of Angus, his childhood friend who suffered a head injury when they both were in England during World War II. Miles overhears a story Morgan tells Angus about their life and uses it in the play. Issues naturally arise as to when a story is personal and when it is only "material". These issues are the same as in American Donald Margulies' "Collected Stories" of 1996, seen last year at the Stratford Festival. Compared with "The Drawer Boy", Margulies' play looks like a sitcom with delusions of grandeur. Margulies takes two acts to reach the point that Healey reaches in one. For, indeed, the second act of Healey's play moves beyond the trendy question of "appropriation of voice" to chart the effect that the story-as-play has on Angus, who is taken out of himself by viewing himself on stage. The dramatic path Healey takes that moves us beyond politically correct certainties into fundamental ambiguities of truth and fiction is brilliant. And he does this all the while keeping his story and characters in the forefront, never lapsing into the didactic or symbolic as do so many young playwrights. For this new production only superlatives are in order. Designer John Ferguson has created a beautiful, clean-lined set with just enough fixed elements to suggests an farmhouse but placed edge on so that we see through the house to a farmland backdrop beyond. He has surrounded the set with a proscenium within the Winter Garden proscenium modelled on the kind of square, moulded archway one finds in Ontario farmhouses and suggesting the the theatrical metaphor implicit in the story. While farmers' outfits have not changed much in 30 years, Ferguson creates a painfully authentic 1970s look for Miles's wardrobe. Kevin Fraser's lighting enhances every scene, setting the times of day precisely and making the backdrop of farmland fade out as night falls. Marc Desormeaux provides interludes of authentic-sounded country music and the often hilarious sound effects. Miles Potter has re-directed the play's original cast for the larger space so that it seems perfectly at home amidst the foliage of the Winter Garden. He has an unerring sense of how to pace the work and draws truthful, exquisitely detailed performances from all three players. Tom Barnet's Miles is a naïve city feller who falls for all of Morgan's outlandish exaggerations about farm life. He is insecure both about himself and his usefulness to the actors' collective. What he is good at is understanding human interactions, which is how he perceives the emotional stasis Morgan and Angus live in and is motivated to help Angus regain his memory. Barnet shows the conviction slowly build beneath his character's awkwardness of the rightness of what he is doing. Jerry Franken, in a great performance, plays multiple levels of Morgan's character all at once. On the surface he is the dour farmer hostile to the intrusion into his life of a young know-nothing. Below that level is the boyhood friend of Angus who will do anything to protect him. And below that is a man whose feelings of guilt have been gnawing away at him since he and Angus returned from the war. It is hard to imagine a better performance of that role, just as it is hard to imagine anyone other than David Fox as Angus. Angus's head injury has left him with no memory of the past whether of years or seconds ago. Though he no longer knows he once had a talent for art (hence the title), the injury has not impaired his ability to do complex math in his head. Fox can show in just a fleeting facial expression a distressful memory briefly rising to the surface and sinking again. His character makes the greatest outward change in the play from the idiot savant we first meet to someone bewildered by the memories that at last start to return and hungry to learn the truth about himself and the past. It is an unforgettable performance. Do not hesitate to see this play. For once the surfeit of Canadian award-giving institutions have rewarded something truly great. With such an intelligent production and such powerful performances, the show is unmissable. Photo: Tom Barnett, David Fox, Jerry Franken. ©1999 Theatre Passe Muraille.